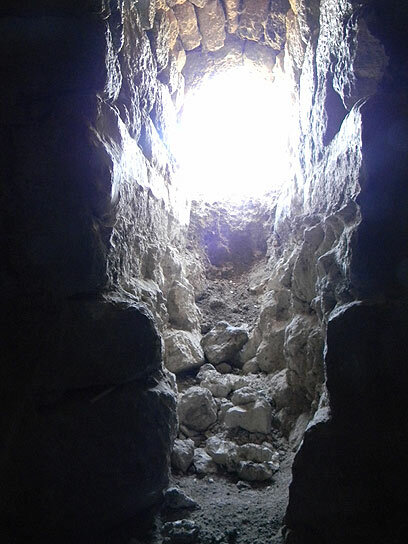 Two antiquity thieves were apprehended at a Beit Shemesh-adjacent archeological dig where they managed to destroy ancient artifacts in their search for gold. The robbers, both Bedouin residents of Dimona, brought digging equipment to the Be'er Limon site late last week, and proceeded to operate there for several nights. On Thursday, in the pouring rain, the pair smashed the walls of a 2,000-year-old well located under a structure from the Crusader Period. They dug deep holes in the ground, causing what the Israel Antiquities Authority deemed as "irreversible damage." Did haredim vandalize archeological site? The suspects said during questioning that they were searching for a treasure. They claimed that a legend, passed on from generation to generation, asserted one of their forefathers buried gold in the old stones. "Baseless fairytales about buried treasures make people crazy," said Amir Ganor, who heads the Antiquities Authority's theft prevention unit. "No one can restore a 2,000-year-old stone wall that has been smashed to smithereens at the hands of the robbers." The authority suspects that another thief operated with the pair, but managed to escape. The thieves were released but are expected to be indicted in the coming days. See all talkbacks "Gold diggers ravage archeological site"